I am sitting curled up on the edge of the bed—where I have been all day—with who do you suppose on the opposite side of the table? Yes, none other than the young lady who has been having the grip so dreadfully at Pittsburgh4! Isnt that too good to be true—that she is here? And this is Monday evening and she has been here since Wednesday, an unusual stay for her. And moreover be it said with no undue boastfulness she is a very different looking person from the parchment colored invalid who stepped off the train with such a cough! We have been worrying so continually about her for the last month and thinking that it was of no avail—our being nearer to her than the Nebraska5 friends. But it has been of some use to us to live in Columbus2 if we do have the small-pox—I suppose you see in the papers that that is our latest diversion. At any rate, she has a better color tonight and her cough comes from the top of her throat and not from the depths as it did. Oh, we are lucky we Columbians! We have been having such a good visit one to be remembered and remembered. I've been sick—nothing either alarming or unusual—and that has shut us up together. I hope your ears have burned. If they have any notion of their proper duties as ears and well conducted ones, they have been burning all this week. One thing we have been talking over about you, is the good time you and Mother6 and I are to have next year in Paris7 together. I think it is really a settled thing that I am to graduate in June—always providing there are no flunks lying in wait for me. My heavy work hasn't hurt me one bit either, in spite of everyone's prophecies. But it is Willa's turn and I must. Hello Mariel1, Hello! How are you? I am pretty fine myself just now. You see I came down here sick in mind and body after a six weeks wrestle with grippe. I hated the world and every one in it. I was just as blue as illness and over work could make me. I was ordered South by my doctor, but at the last moment I decided that I needed Dorothy9 more than I needed the sun Sun, so I came down here to see whether there was one person east of the Missouri10 who would seem either admirable or desirable to a grippy mind. There is, all right, all right. I think you will scarcely be surprised that I have found her so. I leave for Pittsburgh4 in the morning after such Please excuse the mismatched paper. I'll put some sealing wax on to make up for it. a happy week that I'm afraid I shall have to pay a heavy price for it some day. I'm afraid of the Greeks when they bring gifts and when I get a temporary corner on the Fates I tremble. However I'm willing to pay like a little man for this. You know how seldom things are just right—anywhere. Well, they have been just right, that's all, see? Here I am again almost afraid to put my small hand writing down after her bold one. How are you, anyhow, dear girl. It has been a long time since I heard from any of you. Your Mother's11 lovely letter at Christmas time was the last direct news from the Gere family. I wish you would present my best regards to Miss Frances Gere12, the leisurely young lady, who is not in school this year and ought to have time to do things, and find out if she still remembers a sister Kappa13 away off in Columbus O. If there is any irrelevancy in this letter lay it to the conditions. Since we began writing Father14 and Mother6 and Stella15 and Jim16 have come in and are visiting at a great rate with Willa. They all have sent the warmest regards with all kinds of messages that are too long to write. Really though I do think Frances might give us a little news of Lincoln3 and the Geres. As usual, things are more than humming here, conventions and receptions, and dances and oh such loads of work. But I'm well and cheerful, particularly since the advent of the lady across the table and delighted to have met some Nebraska people who came to this convention. It is so good to see someone from that country. Well, young lady, if you can make head or tail out of this very compound letter you ought to be running a great business—but I hope in my part of the mixture you can make out some of the affection that goes with it. I must stop, as it is getting late. My best love to all the family—tell Ellen17 that the class of '99 is the only one—and remember the message to Frances. 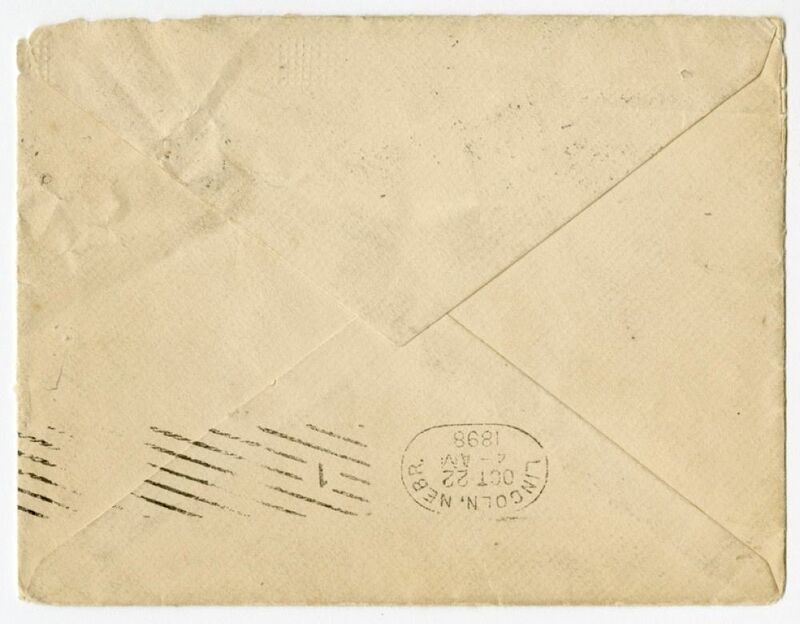 As for your dear Mother you and she know without my saying how every letter from the house of Canfield to the house of Gere is laden with good wishes and best regards. The girls flatter me by asking me to add a line to their compound letter, I do so with pleasure for I want to echo Dorothys wish to have you join us in Europe18 next year. We are very choosy about asking any one but you to make a trio of our little party. But the dear girl who wired us both last summer, and filled her mothers place so admirably in making her home hospitable we really want to help us during our year abroad. Jim has just departed to take Stella home. Their engagement has been announced, you know and they beam with happiness from afar off. Goodbye, my dearest girl. When I get back to Pittsburgh I'm going to write you again—after my hold on the world gets firm again. Document is three leaves, handwritten on recto and verso of each leaf. 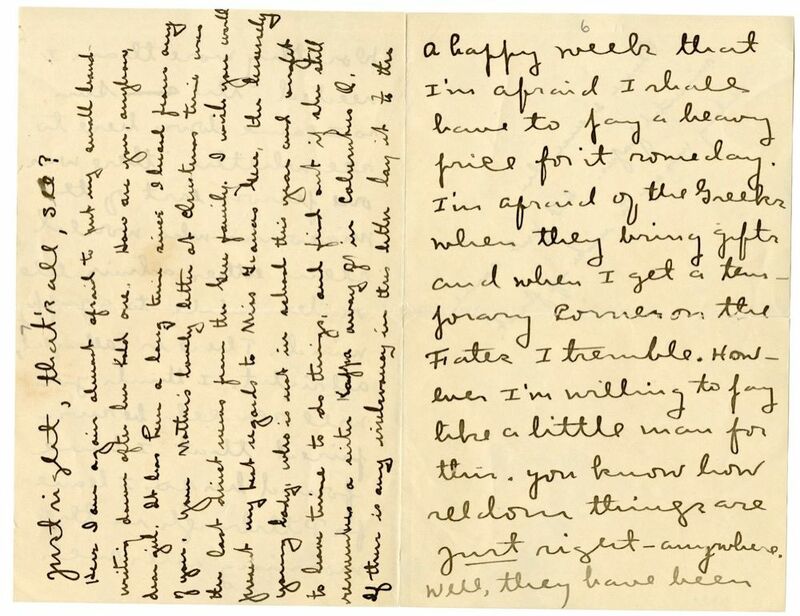 Dorothy Canfield starts the letter and Willa Cather interjects in the middle of Canfield's letter. 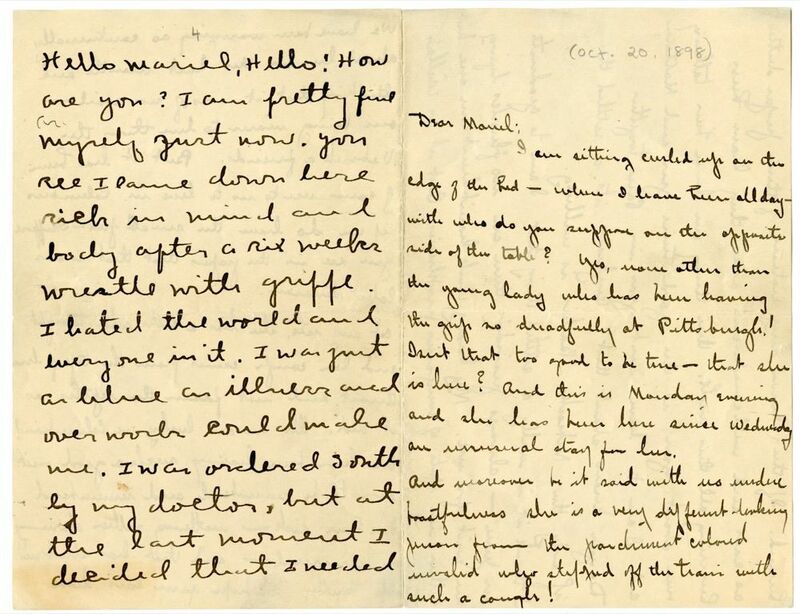 Flavia Canfield writes her own letter at the end of Dorothy Canfield's. 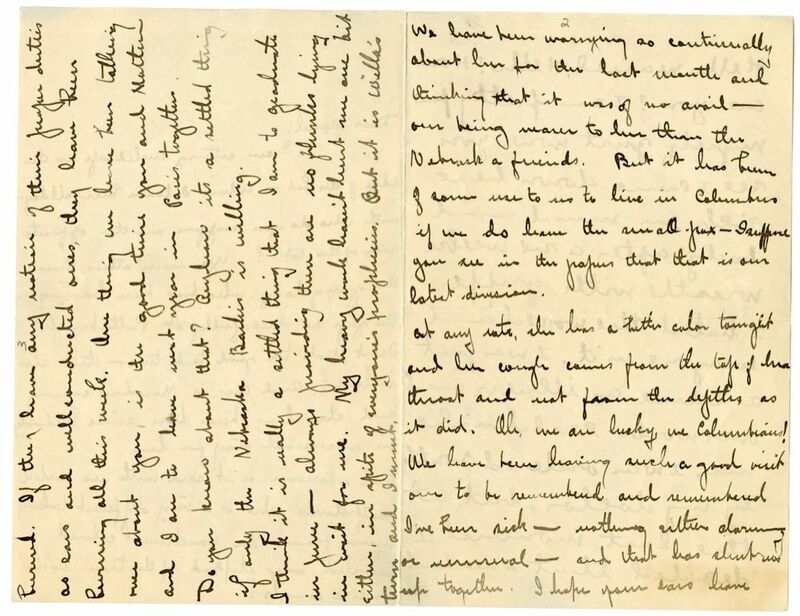 Cather writes another note after Flavia Canfield's. Includes one envelope, handwritten. In Charles Dickens' David Copperfield (1850), the coach driver Barkis asks David to tell Clara Peggotty that "Barkis is willing" to marry her. The phrase became a popular one. Dorothy Canfield was a member of the Kappa Kappa Gamma sorority at the Ohio State University. Gere, Mariel Clapham (1874-1960). Cather’s university friend; a teacher. Mariel Gere, eldest daughter of Charles H. and Mariel C. Gere, born in Lincoln, NE, entered the University of Nebraska's prep school in the same year Cather did. She and her sisters visited Cather several times in Red Cloud, NE. Both were members of the Union Literary Society until Gere joined the Kappa Kappa Gamma sorority in 1892. Gere graduated in the science course and taught chemistry at Lincoln High until 1941. She also served on the Lincoln City Library board for many years. Cather and Gere remained friends and correspondents; Gere defended Cather from accusations that she had been arrogant and friendless during her university years. Canfield, Flavia Camp (1844-1930). Clubwoman; painter; mother of Dorothy Canfield. Flavia Camp was born in Wisconsin, although her family came from Vermont. She was an early graduate of the University of Wisconsin and taught school and art before marrying James H. Canfield in 1873. 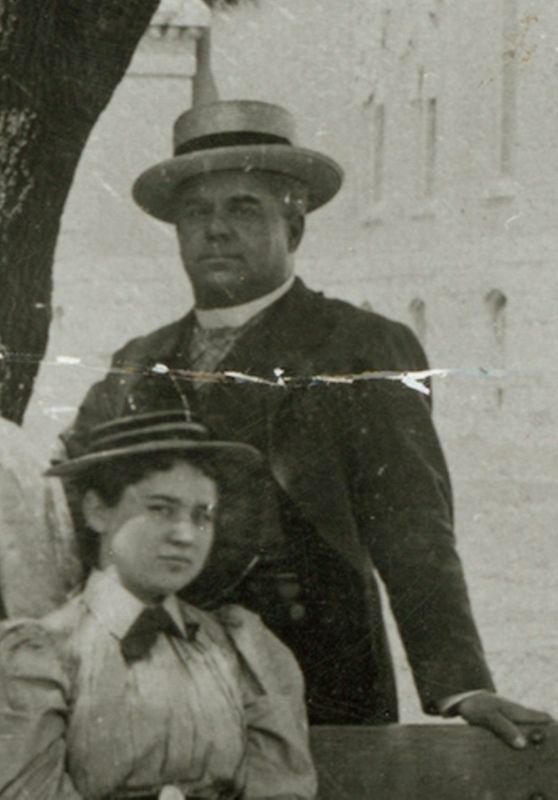 Their son James A. Canfield was born in 1874, and their daughter Dorothy in 1879. A painter, Flavia studied in Europe, taking her daughter with her on several occasions. She was an activist and social reformer as well, believing in the power of women to effect change by organizing. She was one of the founders of the University of Nebraska Women’s Club, as well as the Ohio State Women’s Club and many others, and was president of the Ohio Federation of Women’s Clubs. Late in her life she wrote Around the World at Eighty (1926), an account of a world tour she took at that age. Fisher, Dorothy Canfield (1879-1958). American novelist; educational and social reformer. Dorothy Canfield and Willa Cather became friends in 1891 at the University of Nebraska in Lincoln, where Canfield's father, James Canfield, had come to serve as Chancellor. The family moved to Columbus, OH, in 1895 when James Canfield assumed the presidency of Ohio State University, from which Dorothy graduated in 1899. She then followed her father to New York City, where he became Librarian of Columbia University, and she pursued graduate study in Romance Languages at the University of Paris and Columbia, from which she earned a Ph.D. in 1904. 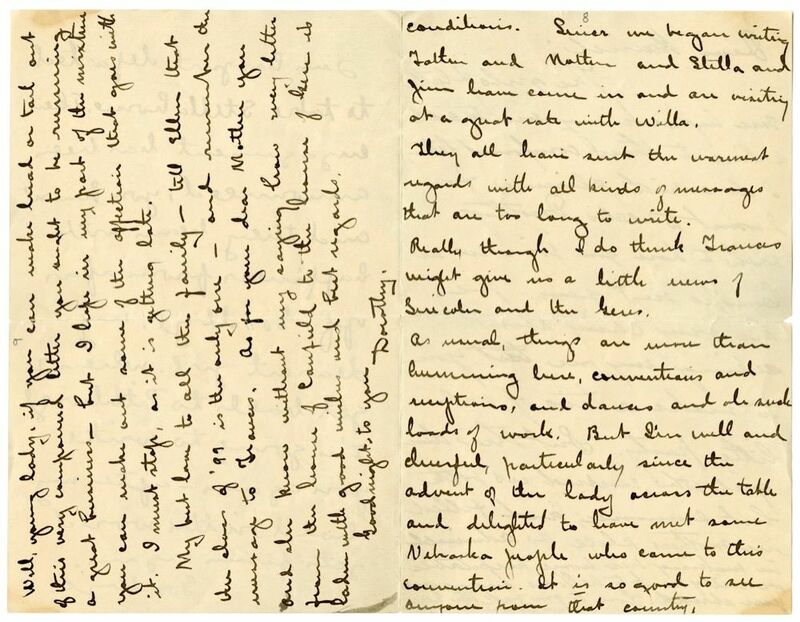 On Cather’s first trip to Europe, she spent time in France and England with Canfield, including an awkward visit to the home of poet A.E. Housman. Cather derived the central character of “The Profile” (1907) from Canfield’s friend Evelyn Osborne, whom Cather had met in Europe. Cather and Canfield became estranged for more than a decade because Canfield objected to the story’s planned inclusion in The Troll Garden (1905). Canfield married John Redwood Fisher in 1907, and their primary residence was Arlington, VT. Canfield Fisher had spent 1916-1918 in France engaging in war relief work, and Cather’s consultation with her about the accuracy of her depiction of wartime France in One of Ours (1922) led them to reconcile. In 1925 Canfield Fisher became a founding member of the Book of the Month Club selection committee. 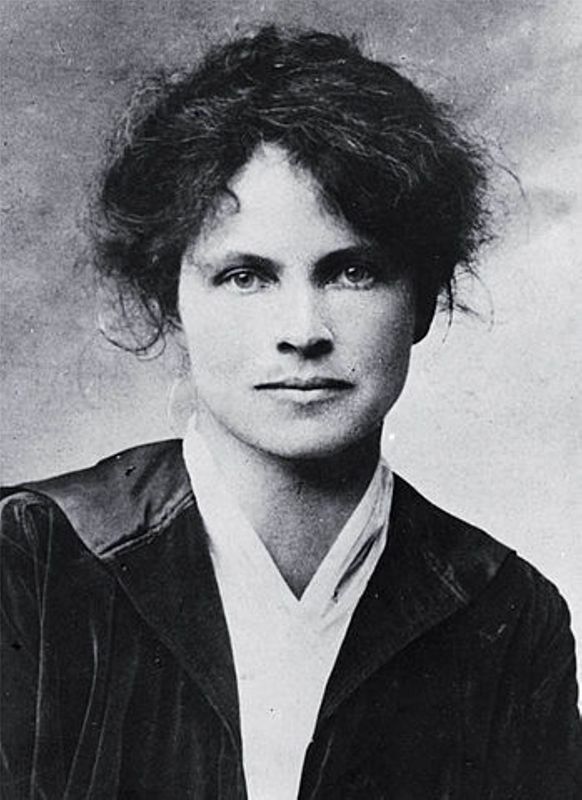 She published her novels (most of them very popular) under the name Dorothy Canfield but her various nonfiction works as Dorothy Canfield Fisher. Gere, Mariel E. Clapham (1838-1912). Cather’s friend; mother of her friends, the Gere sisters. Mariel Elizabeth Clapham was born in Washington, D.C., the daughter of Captain John Clapham and Mariel Goodwin Clapham. 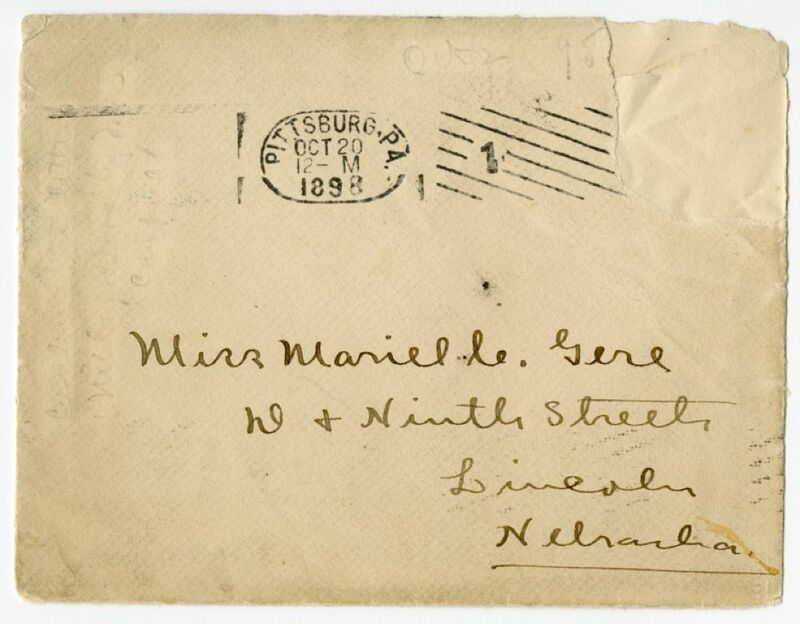 She corresponded with Charles Gere for several years before their marriage in 1871, when she came to Lincoln, NE. 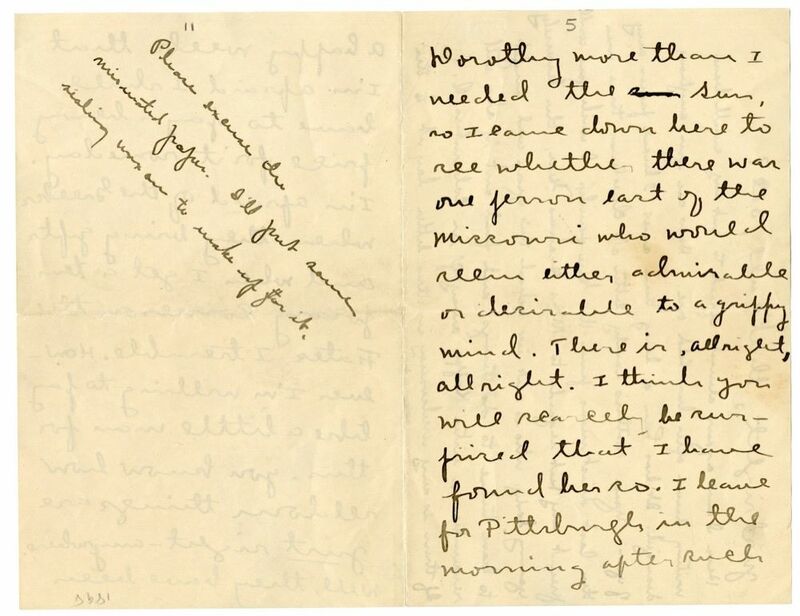 When Cather became friends with their daughters Mariel, Ellen, and Frances, she welcomed her to their home at 8th and D streets. Mrs. Gere, according to Cather, persuaded her to grow out her close-cropped hair. Gere, Frances C. (1877-1965). Cather's friend. Frances Gere, the youngest child of Charles H. and Mariel C. Gere, was born in Lincoln, NE. She entered the University of Nebraska in 1894 and graduated in 1898. Like her sisters, Mariel and Ellen, she joined the Kappa Kappa Gamma sorority and lived in Lincoln the remainder of her life. Canfield, James Hulme (1847-1909). Educator, chancellor of the University of Nebraska. James Canfield was born in Ohio but grew up in Vermont and New York City. After graduating from Williams College in 1868, he went west, where he married Flavia Camp in 1873. Their children were James A. Canfield and Dorothy Canfield (Fisher). He was appointed professor of history at the University of Kansas in Lawrence in 1877; from there he was called to be chancellor of the University of Nebraska in 1891. Cather’s class made him an honorary member of their class, as they had all entered the university that year. A dynamic man, he was popular with the students and with people throughout Nebraska, a tireless campaigner for the value of the rapidly growing university to the state. Ohio State University called him to its presidency in 1895; from there he went to Columbia University as head librarian from 1899 until his death in 1909. Canfield, Stella Elliott (1876-1947). Dorothy Canfield Fisher’s sister-in-law. Born in Nebraska, the daughter of a china dealer, Stella Elliott entered the University of Nebraska with the class of 1898 and was for a time an instructor in the physical education department, then a new field for women. As the younger sister of one of Cather’s classmates, Charles A. Elliott, she may have known Cather at the university. She married James A. Canfield in 1899; they had two sons. She and Cather met occasionally in later years. Canfield, James A. (1874-1959) (“Jim”). American businessman; Dorothy Canfield Fisher’s brother. The only son of James H. Canfield and Flavia Camp Canfield, the younger James Canfield was born in Michigan, then moved with the family to Kansas, then Nebraska, where his father was chancellor of the University of Nebraska from 1891 to 1895; he was Cather’s classmate there. The family moved to Columbus, OH, where Cather visited them in 1898; he had just become engaged to Stella Elliott, another Nebraska alumna, whom he married in 1899 and with whom he had two sons. He owned a wholesale paper business in Westchester County, NY, until his retirement to Florida by 1940. Cather kept in occasional touch with James and Stella Canfield, largely through his younger sister, Dorothy. Gere, Ellen Bladen (1875-1941) (“Ned” or “Neddums”). Cather's friend. Ellen Gere, the second daughter of Charles H. and Mariel C. Gere, was born in Lincoln, NE. 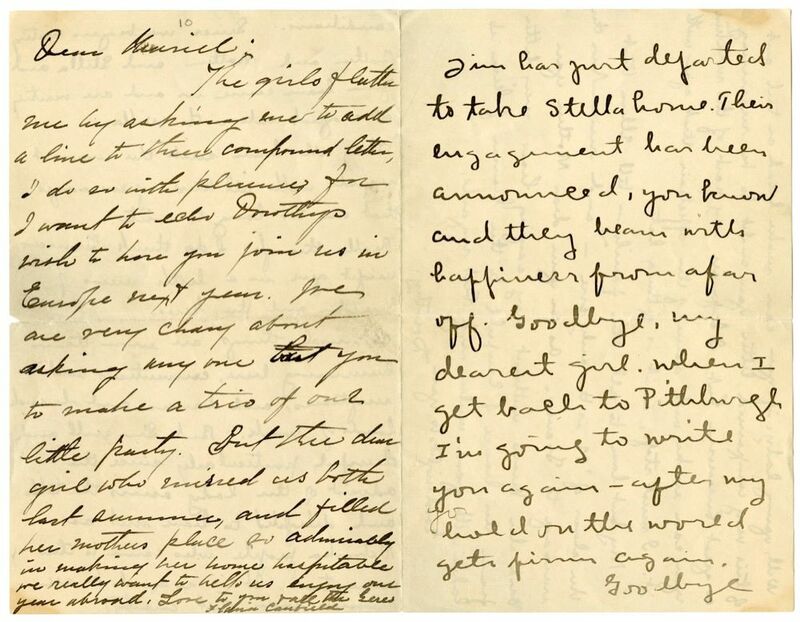 She visited Cather in Red Cloud, NE, with her sisters, and Cather included her in her correspondence in the 1890s. 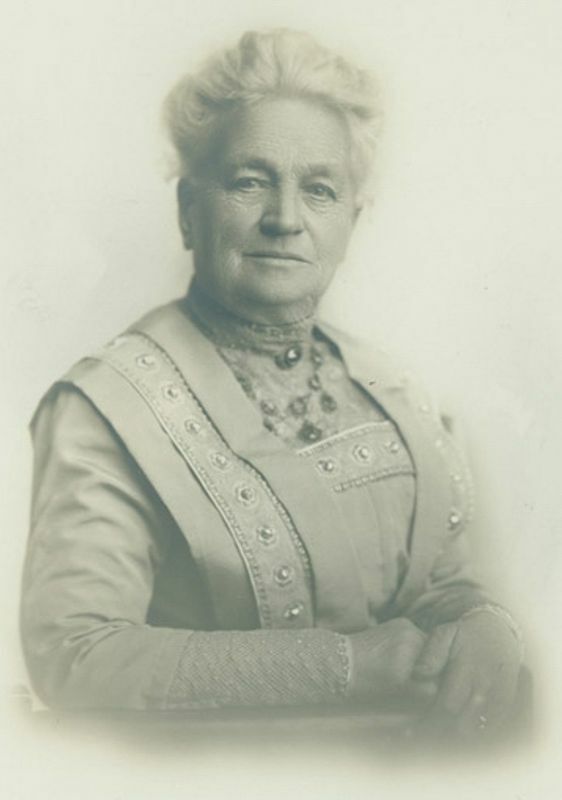 Ellen Gere entered the University of Nebraska in Lincoln about 1892, but graduated with the class of 1899. In the 1920s she adopted two children, believing, with her friend Dorothy Canfield, that women who wanted to be mothers did not have to be married.